The circuit was composed primarily of dust roads sealed with tar, with each lap taking almost one hour for the faster cars. 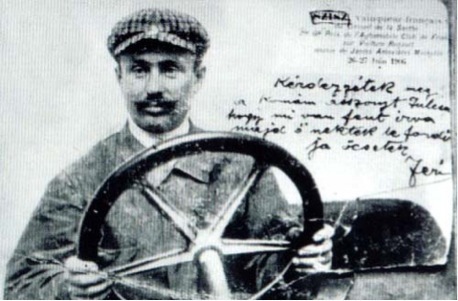 Paul Baras, in a Brasier, set the fastest lap of the race on his first lap, holding the lead until the third lap, when Szisz took over first position, holding it to the finish. Hot conditions melted the tar, which the cars kicked up into the faces of the drivers and riding mechanics, blinding them and making the racing treacherous. Punctures were common. To address concerns about previous races, during which spectators crowding too close to the track had been killed or injured, 65 km of palisade fencing were erected around the circuit, concentrated around towns and villages, and at the ends of lanes, footpaths and roads intersecting the track. 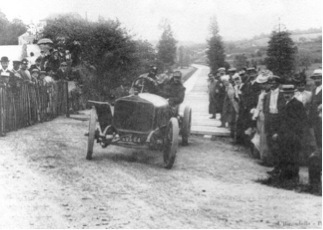 Planking was used to construct two bypasses to avoid the towns of Saint-Calais and Vibraye as an alternative to the system used in the earlier Gordon Bennett races, where cars would slow down to a set speed passing through towns and were forbidden to overtake – a forerunner of the pit-speed rule. Ten French manufacturers entered cars in the Grand Prix, with two manufacturers from Italy, and one from Germany. There was a maximum weight limit—excluding tools, upholstery, wings, lights and light fittings—of 1,000kg, with an additional 7kg allowed for a magneto or dynamo. Five manufacturers used a chain drive system for transmission; the rest used drive shafts. All entries had four-cylinder engines, from 7,433cc to 18,279cc. Teams were allowed to change drivers and equipment, but only between the two days. Michelin, Dunlop and Continental supplied tyres for the race. Michelin introduced a detachable rim with a tyre already affixed, which could be ‘quickly’ swapped onto the car in the event of a puncture. 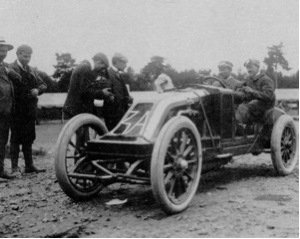 Only the driver and his riding mechanic were allowed to work on the car during the race, and carrying the detachable rims could save over ten minutes per wheel-change. Additionally Renault had the luxury of hydraulic dampers invented by Louis Renault – the first ever on a racing car. Roads around the track were closed to the public at 5am on the morning of the race. A draw took place among the teams to determine the starting order, ands cars were dispatched at 90second intervals. grew hotter – it reached a high of 49°C – the tar began to melt, which proved to be a greater problem than the dust, being kicked up by the cars into the faces of the drivers and their mechanics, seeping past their goggles and inflaming their eyes. Szisz finished the first day just before noon in a time of 5hr45min, 26 minutes ahead of Albert Clément of Clément- Bayard, with FIAT driver Felice Nazzaro in third, 15 minutes behind Clément. Seventeen cars completed the first day. The time each car set on the first day determined the time they set off on the second day, hence Szisz’s time meant he started at 5:45am, followed by Clément at 6:11am, and Nazzaro at 6:26am. 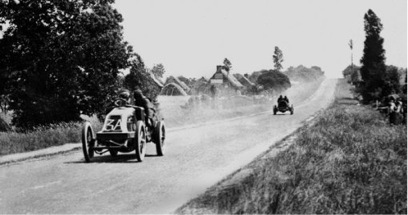 This method ensured that positions on the road directly reflected the race standings. A horse, which had been trained before the race to the loud noises, towed each competitor out of parc fermé to the start line. As neither driver nor mechanic could work on their car until they had been given the signal to start the day’s running, Szisz and Clément began by heading directly to the pit lane to change tyres and service their cars. Clément completed his stop more quickly than Szisz, and Nazzaro did not stop at all, and so Clément closed his time gap to Szisz and Nazzaro closed on Clément. Szisz’s Renault suffered a broken rear suspension on the tenth lap, but his lead was so great he could afford to drive cautiously with the damage. He took the black flag of the winner [sic] after a total time of 12:12:07; he had also been fastest on the straight at 154 kph. He finished 32 mins ahead of Nazzaro, who was 3 mins ahead of Clément. Amazingly there were only six accidents, and just one injury, but everyone suffered burns and eye problems. After three years Renault had slowly disappeared from GP racing, until returning in 1977. And Szisz’s grave, just outside Paris, is maintained by the ACF and Renault. The Grand Prix name (“Great Prize”) referred to the prize of 45,000 French francs to the race winner, equivalent then to 13kg of gold. Until the First World War it was the only annual race to be called a Grand Prix (often, the Grand Prix), and is commonly known as “the first Grand Prix”. Meanwhile, on this day in 2002, Ferrari was fined $1 million for breaking podium protocol at the Austrian Grand Prix earlier in the year after Rubens Barrichello had moved over to allow Michael Schumacher to win. But on the podium Schumacher pushed his reluctant team-mate onto the top step in an attempt to appease the booing crowd. Rather than slapping a fine on the team for disgracing F1 (team orders were legal at the time), the FIA could only penalise Ferrari for its antics on the podium. OK, not 1906 but the Google is informing me today is also Antoni Gaudi’s 161st birthday. Great series, keep them coming. PS I may have to borrow some of the “Le Petit Parisenne” attitude for my characters, it seems to fit right in with today’s hyper enttitled class of owners. wow – 13 kilos of gold is around $560,000 in todays market! not a bad prize I suppose. But I’m unable to determine who would have put up such a prize, especially as this race came about as a reaction to the Gordon Bennett races. 2 guys in a vehicle, driving over rough roads, long distances, having to do wheel changes and repairs themselves, and all done in timed stages over a number of days…..isnt that what we call rallying now? That’s nothing. Rolls Royce made a 36 liter engine. Thank you. Enjoyed this one very much!